I discovered this lovely book in the gift shop of the Boston Museum of Fine Arts. Softening edges has been an important part of my painting process for many years. When I am painting I always step back to look at the work and I am often surprised by the physical reaction my body has if there are too many hard edges. It feels like a jolt. I have had an awareness of this almost obsessive compulsion to soften edges and have wondered why am I so compelled to do it? I do think the moves we make as artists which are often unconscious have a much deeper meaning. I went to Amazon.com to grab a picture of the book cover for this blog post and I discovered to my amazement that the volume I paid a little over fifty dollars for was selling for over two hundred. I had to scrape a couple of spots of gesso off mine.. whew!!! This book primarily explores the work of Whistler and Inness starting with Whistlers moody, beautiful, and stunning Nocturne series. A quote from the dust jacket states, ” Through an innovative manner of handling paint, a group of American artists around 1900 created deceptively simple canvases that convey images of shimmering, transience, visions suggested rather than delineated. 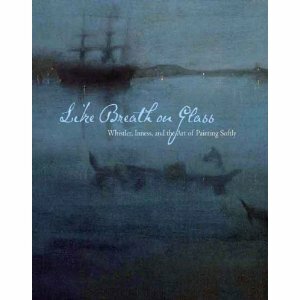 Focusing on this singular aesthetic characteristic -softness- Like Breath on Glass explores the painterly phenomenon of fifteen important artists.”. Perhaps your local library will have access to this book. The many reproduction plates and the elegance of the art critique make it a worthy addition to any painter’s library. 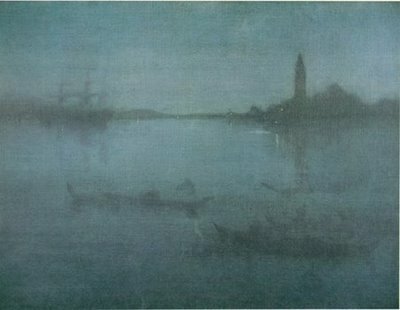 In addition to the book cover I have posted images of Whistler’s “Lagoon” and my favorite Inness painting “Hazy Morning Montclair”. Really enjoyed reading this Jamie!!!! Thank you for sharing this book with us. Like you, I love the soft edges and am inspired by Whistler’s nocturnes. And your work inspires me, too. Just found your blog and so enjoyed this post! As an abstract painter I have noticed my own desire to “soften the edges” sometimes struggling with having no distinct focal point. Now I understand that this softness in visual expression is valid. Thanks for sharing your passion.